“Stonehenge” - Andrew Savage, April 2016. 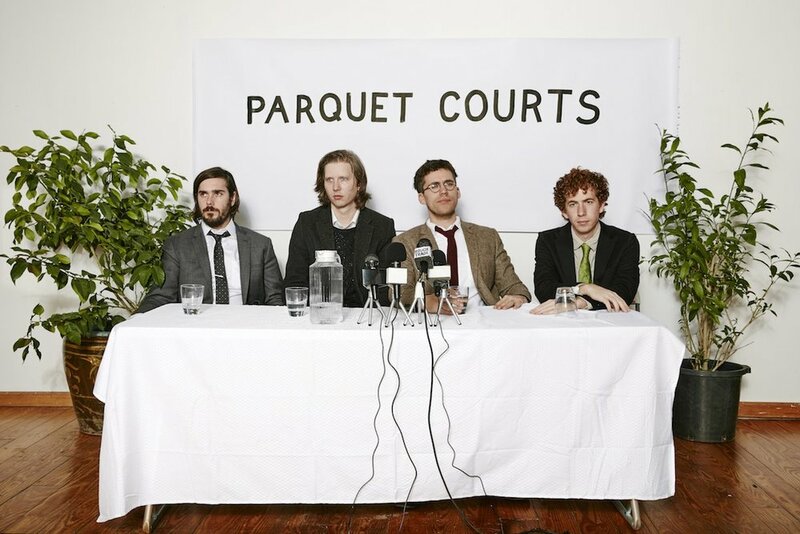 Besides being one of our favourite bands, Parquet Courts have the distinct honour of being the first artists to contribute to Deluxe twice. A couple of years since we first spoke, Andrew Savage made time to talk art, cities and how record shops link them all together. Deluxe: Hey, thanks for letting us use “Stonehenge” on the front cover to this issue. Andrew Savage: No worries at all. D: I knew you had created artwork for the band, but I wasn’t aware that you made artwork in its own right till I heard about “Color Studies” - that was your first exhibition right? AS: Yeah, so there were two of them actually. One of them that happened in New York in July and then one that happened in Cologne in September. They were both great actually. D: Good experiences?… I know you are used to being on stage, but was it nerve-wracking putting it out there? AS: The New York one wasn’t as I knew a lot of the people there and it was my… well, home field I guess. The German one was a little scary because I didn’t really know anyone there and it was a bunch of strange Germans who are notoriously frank people… the opening was really well attended - it was part of an art fair that was taking place called “Cologne Art” - where I also met an English guy called Phil Collins.. (long pause) no relation… he’s a well known contemporary artist who was having a film debut at the festival and he is actually working on a music video for us… pretty much as we speak in Berlin. D: There is quite a Germanic connection with the new LP so far… “Berlin Got Blurry” was shot in Berlin too right? AS: Yeah, we have two music videos, shot on 16mm film, shot on location in Berlin… I swear we didn’t plan that. D: I really liked the video, Claes Nordwall directed right… how do you pronounce Claes’ name? Clays? AS: “Claiss”… He’s a Swede. D: I’d only seen his name written down. I really like Iceage and saw one of his videos for those guys a while back. AS: It was really important for me to shoot the video there as that was where the song was written and I guess what the song was about too. I am fond of Germany, I’ve spent quite a bit of time there over the last few years, I am fond of it in a very curious way. You know, it’s so… it’s relatable - Berlin especially - to a metropolitan area like New York so not drastically different, but some things are just so… entirely “German” and so very foreign. I had my art show there, Parquet Courts have played there a lot, we spent time there shooting the video… I guess it was like a return to the scene of the crime. It’s where we wrote the song. D: Talking about New York, I’ve seen you described as “quintessentially New York” in terms of musical lineage. Do you feel like you sound like you come from New York? AS: I guess… it’s such a music writer thing to say isn’t it? AS: It’s really not the way I think about music. You know, the band started in New York, we live in New York so of course it is influential on us, but to be honest I don’t really care about romanticizing New York in the 70s or 80s or whatever.. I think it is silly and a bit dishonest to harp on about that era. Those bands were writing in their own moment and I think that we do that too... We write honestly about what we actually know about rather than romanticizing an era that predates you. D: I guess in many ways being a New York band can be a slightly hard label to move away from.. It’s not like you get a fresh shot, people have preconceptions. D: I think there is a similar situation with London… a lot of the preconceptions are based on bands sounding like bands that either did or didn’t exist 30 or 40 years ago… it makes it very hard to break through. AS: Which to me feels negative. D: Do you spend much time in New York… besides living there, like part of the scene? AS: Do we play much… well, we only played three times last year, so really not as much as we used to. Before Light Up Gold took off we’d play three or four times a month so not as much as we’d like to. I think considering the amount of touring we do, we actually play here quite a bit. D: Is it a supportive scene? AS: It can be both. I don’t think it is competitive, we’ve certainly not felt a sense of competition. I’ve always been fortunate enough to be part of a group of artists that aren’t interested in that sense of competition… I guess to a degree there is that, but it’s never been too palpable and certainly not on my mind. D: I wanted to talk a bit more about your artwork if we can… I read that you have been using serigraphy… am I pronouncing that right? AS: Serigraphy is basically… well, it’s a genteel word for screen printing. AS: All screen printing is kinda squidgy, it’s basically just screenprint by another name. D: How different to you does the process feel in terms of making music or making printed artwork? Besides that it is just you rather than a band effort? AS: I guess I am known more for being a musician, although I have actually made visual art longer. I think being a musician has a more immediate reward, certainly now, as I know an audience will hear it where that is not necessarily the same with my artwork. I don’t get a bigger thrill out of creating either really, they are both an essential part of being alive. D: You are pretty much touring throughout the rest of the year now, are you ready for the road? AS: Yeah, well, we just got done with a short tour two day ago. We’ve been playing a lot of new songs. D: How it is feeling playing those new songs live? AS: Good! It’s always kind of an exciting and nerve wracking thing playing new material for the first time because it hasn’t quite cemented itself in your mind yet. I wasn't drinking for the first few shows as I wanted to really dial into it and do it all right... it wasn't in my bones yet. Once it’s in your bones you can start to play around with it a bit and it takes on a life of its own as a live song.